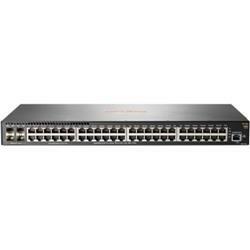 The Aruba 2930F Switch Series is designed for customer creating digital workplaces that are optimized for mobile users with an integrated wired and wireless approach. These basic Layer 3 access switches are easy to deploy and manage with advanced security and network management tools like Aruba ClearPass Policy Manager and Aruba AirWave and are ideal for enterprise edge, SMB and branch offices. A powerful Aruba ProVision ASIC delivers performance and value supporting the latest SDN applications with future proof programmability. It supports 10GbE uplinks, PoE+, robust QoS, and RIP routing. Delivers a consistent wired/wireless user experience with unified management tools such as ClearPass Policy Manager and Airwave Network Management. Provides optimal configuration automatically when connected to Aruba access points for PoE priority, VLAN configuration, and rogue AP containment. Convenient built-in 1GbE or 10GbE uplinks and PoE+ models deliver right-size network access performance. Robust basic Layer 3 feature set includes static and RIP routing, ACLs, sFlow, IPv6 with no software licensing required. Designed with a powerful ProVision ASIC and support for OpenFlow, the Aruba 2930F is ready to take advantage of SDN applications such as HPE Network Visualizer, Optimizer, and Protector Software products. Supports up to 370 W of internal PoE+ power for wireless access points, cameras and phones.